Contact us for information on our next orientation meeting. Foster Care Services are available to children of all ages in the Santa Clara County Foster Care System. For information on becoming a foster parent, please call us toll-free at 408-278-2596. In California, there are more than 100,000 children who have been removed from their families because of child abuse or severe neglect and are impacted by trauma, grief and loss. These children differ by age, gender and ethnicity but share the same crucial need for a stable, caring, temporary home with adults they can trust. The primary goal of Bill Wilson Center's Foster Care Program is to provide stable, caring, temporary homes for our special needs children who have been removed from their families due to various reasons of abuse or neglect. Foster homes are intended to provide short or long term care while the child prepares for permanency, which means either their return to appropriate, stable birth family members, placement into an adoptive family, or adoption by the foster family. You can make a life-changing difference by opening your home to a special child. We host a free, no obligation orientation at our San Jose office (please call for details). For more information or to set up a one on one meeting with a foster care coordinator, please call 408-278-2596. The following information is designed as a brief overview of Bill Wilson Center's foster care services. More in-depth information is provided during the orientation process or from one of our staff members. An overview of the child welfare system in California as kids in need of foster care and available for adoption come from the child welfare system. Descriptions of the children commonly in need of families. An overview of our agency and a review of legal requirements and applications. Family Preparation - Initial Training: (24 hours) "Preparing to Parent with Love and Skill" is our primary training for prospective foster and adoptive families who have completed the application process and are awaiting the placement of a child or children. It is usually held on three consecutive Saturdays, plus one 3 hour weekday evening training. Your journey begins with the family study, our mutual assessment of the needs and characteristics of a child (or children) that would best suit your family and your goals. 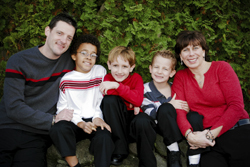 The family study is a series of personal meetings with a Bill Wilson Center social worker. Intensive Service Foster Care Training: (36 additional hours) This training equips foster parents with the tools to care for a host of behavioral issues that could arise with their foster child. After completing the initial 23-hour Family Preparation training, you will receive 16 hours of training on de-escalating and intervening in intense behaviors. The remaining hours are devoted to special classes offered through our agency or in the community, pertaining to parenting or behaviors. Our social work team and you decide upon the curriculum. We take the time to learn about your history, relationships, parenting experiences, and your goals. There are few things that prevent someone from being a potential match for a child. We are less interested in what happened in your life than how you handled it and what you learned from it. Once the interviews are complete, you and our social worker agree on the age range, gender, background and other characteristics of the child(ren) you are able to provide a home for. The study is written and reviewed by our Social Work Team, which will then go to work to create a match with a waiting child. Home studies are strictly confidential. Provides a therapeutic home to one child age 12 to 17 where they can learn skills, experience consistency and structure safe enough to welcome a permanent home. This care can last as little as a few months, but most last about a year. During this time you will be involved with other staff as an equal member of our treatment team: each family has a case manager and staff members are available around the clock in case of emergency. Intensive foster parents have experience providing foster or adoptive care, are health or allied health professionals, or are experienced parents with strong and proven parenting skills. Foster parents provide a caring home for a child or a group of siblings while the birth parents are working on improving their lives with the plan of reunifying with their children. The foster parents will be asked to be an adoptive home for the children if the birth parents fail to meet court requirements to reunify and regain custody of their children. Homes are needed to provide short term housing, normally up to three weeks, for youth ages 11 to 17. These teens come from homeless families or families that are experiencing family conflict. The teen and their parents receive family and individual counseling with the goal of family reunification. Host parents receive a monthly stipend for keeping a bed available and an additional daily stipend when a teen is in the home. Foster homes are desperately needed for our newest specialized program called Treatment Foster Care of Oregon (TFCO). TFCO is a national model that is recognized as an evidence based practice and has generated much success for middle school to high school youth in as short as 6-9 months! Foster Parents are trained in how to administer a Point and Level System supported by research on youth with social and behavior problems and their treatment. The three key elements focus on the development of pro-social skills, the use of tangible rewards to motivate youths’ pro-social development and sanctions to suppress their problem behaviors. The third element is the system’s ability to address a challenge typically faced by people working with youth who exhibit problem behaviors by eliminating the youth’s sense of feeling treated “unfairly” and discourage feelings of victimization. TFCO foster parents receive $2400/month for a “One Home, One Child” youth who is carefully matched to your family. Trained social workers that are employees of Bill Wilson Center visit the child(ren) or teen and foster parent each week to provide services and support. The social worker ensures that the child's needs are being met and that foster parents have the tools needed to care for the child. Additionally, there is a 24/7 emergency line available in which a member of the Foster Care team can respond to crises or other urgent matters. Counseling, life skills coaching and other supportive services are also included in the service plan as needed through the continuum of services provided by Bill Wilson Center. Monthly Support Groups led by staff and experienced parents. Seminars on topics chosen by our families. Opportunities to attend adoption-related conferences. Families providing concurrent care receive a stipend to cover the expenses of providing a home for a child that ranges from $950-$1,050 a month per child depending on the age of the child. Families providing care under the Intensive Treatment Foster Care Model receive a stipend of $2,156 a month. Families providing care under the MTFC Model receive a stipend of $2,400 a month. Call Bill Wilson Center at (408) 278-2596 to speak with a Recruitment and Training Coordinator for further information and to arrange to attend an orientation meeting.